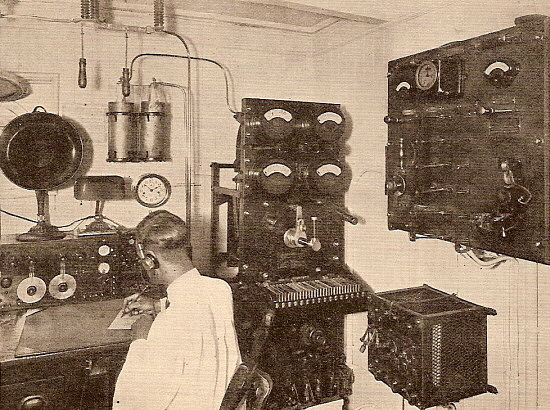 "The Classic Shipboard Wireless Receivers"
photo: 1920s shipboard radio room with an SE-1420 receiver and what looks like a Kennedy 521 AF amplifier. The main transmitter is a quenched spark gap type. Power input switching and monitoring equipment is mounted on the wall. The SE-1420 was designed for the Navy at the close of WWI by Louis Hazeltine, who was a Stevens Institute graduate and later taught there. 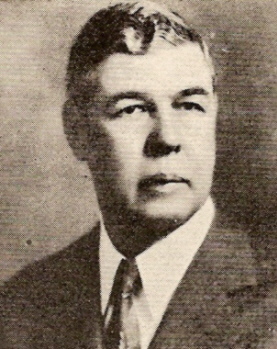 Hazeltine, in addition to teaching at Stevens Institute, was also a consultant to the Washington Navy Shipyard. A former student of Hazeltine's, L.C.F. Horle, was the technical leader at the Washington Navy Shipyard and the laboratory there was responsible for radio receiver design. 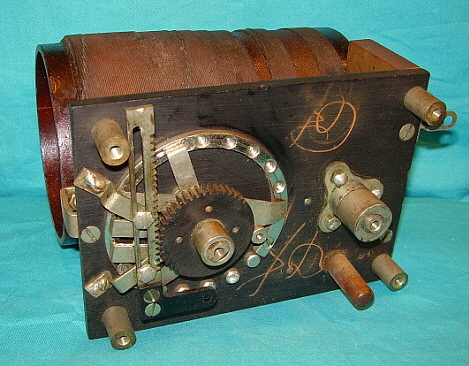 Horle engaged Hazeltine to design a new wireless receiver for military use. What the Navy wanted was a receiver that could operate in the presence of nearby spark transmitters without interference and would allow stable operation while the detector was oscillating for reception of arc transmitters. The Bureau of Steam Engineering was in charge of Navy radio equipment at the time and most receivers were designated with the prefix "SE." Hazeltine's new receiver was going to be designated SE-1420. It borrowed a lot from its predecessor, the SE-143, in general appearance but, unlike its predecessors, the new SE-1420 was going to be a vacuum tube receiver. This went against all Navy tradition since the early days of spark. The Navy manuals of the day condemned the vacuum tube as "unreliable" and "power consuming." >>> Hazeltine first utilized a three-circuit tuner, that is, adjustable tuning of the antenna circuit, the detector grid circuit and the detector plate circuit, to provide excellent sensitivity. He then used a completely shielded cabinet and isolated the Antenna Tuner circuit from the Secondary Tuner circuit with another shielded panel. This complete shielding would eliminate any stray pick up, hand-capacity effects or any coupling between the two circuits. Using a sharply tuned Antenna Tuner helped to improve selectivity and reduce adjacent frequency interference. By using a small Coupling Coil mounted inside the Antenna Coil and only allowing the energy from the Coupling Coil into the Secondary Tuner, further reduction of unwanted signals was realized. The two main inductors used bank-wound Litzendraht wire coils to reduce capacitive losses. "Dead turns" on all switched inductances were grounded by the action of the switches to further reduce losses. All of these efforts increased the selective nature of the SE-1420's tuning ahead of the detector input. The regeneration, called "TICKLER," was provided by a variometer that was built into the secondary inductor form. The TICKLER controlled the sensitivity and somewhat the selectivity of the receiver. The TICKLER also would allow the detector to be operated as an Autodyne or oscillating regenerative detector. Since the detector was oscillating at the tuned frequency this provided a heterodyne action with the incoming signal that the allowed demodulation of an arc transmitter's continuous wave (CW) signal. When operated as an autodyne, the receiver requires complete shielding to eliminate hand-capacity effects and stout construction for stability. The detailed design effort was necessary because all Navy (and most other maritime vessels) used either spark or arc transmitters which usually produced very broad spectrum signals. Early receivers were so insensitive and tuning so crude that the broad transmitted signal was usually an advantage at attracting attention. The inability to have simultaneous operation of nearby stations led to sharing "airtime" - a gentleman's agreement that allowed most wireless operators to co-exist. Wartime was a different situation however and better, more powerful transmitters required better, more selective receivers. As the spark gap transmitter was improved and its bandwidth narrowed, the receivers became more sensitive but not necessarily more selective. They still responded to the fairly broad spectrum signals that prevailed. At the time the SE-1420 made its appearance, its ability to function in the presence of nearby spark and arc transmitters made it an instant necessity for all sea going vessels. 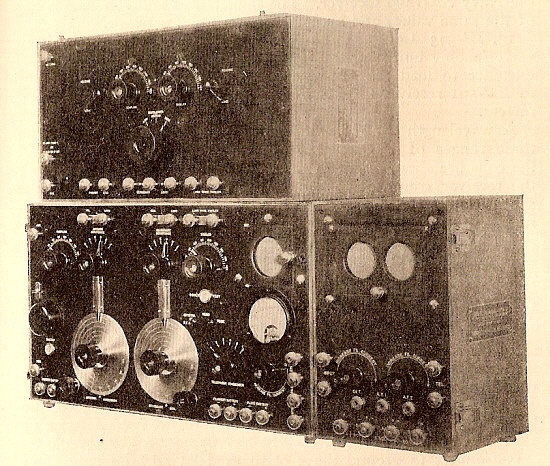 Several contracts were issued for SE-1420 receivers in late 1919. The initial contracts were for 400 receivers from AMRAD (American Radio & Research Corporation,) 400 receivers from Wireless Specialty Apparatus Company and 300 receivers from Sperry Gyroscope Company. These contacts were renewed and extended into 1920. 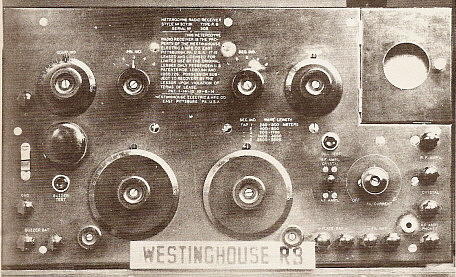 Westinghouse designed their version of the SE-1420 receiver late in 1920, probably for use by the International Radio Telegraph Co., one of their subsidiaries. In 1921, Westinghouse submitted this version to the Navy for assessment but they were not offered a contract. Westinghouse designated their version as the Type DB Medium Wave Receiver and then offered it to the commercial user market. The various SE-1420 receivers will have some differences depending on the contractor and the time period of manufacture. AMRAD versions did not use a Telephone Condenser switch and mounted an ID tag on the front panel where the TC switch is on the WSA version. Also, AMRAD binding posts use hex nuts rather than knurled thumb nuts. "National Electrical Supply Company," a supplier of electrical and automotive parts located in Washington D.C., was added to the contractors rather early in the SE-1420 build history. "National Electrical Supply Company" is sometimes confused with Reginald Fessenden's company, "National Electrical Signaling Company" since both are usually referred to by the acronym, "NESCO." (Fessenden's NESCO was reformed into International Signaling Company in 1917 and then, after WWI, was purchased by Westinghouse to form their International Radio Telegraph Co.) Most National Electrical Supply Co. versions are very similar to the earlier AMRAD versions. Since AMRAD was bankrupt by 1924, later similar appearing versions are usually National Electrical Supply builds. 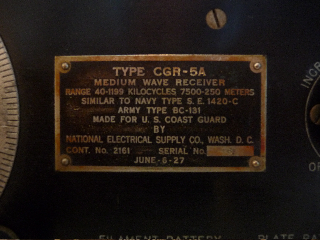 Later Signal Corps versions are sometimes designated as BC-131 receiver. The later versions of the SE-1420 and IP-501 receivers will have less elaborate tube sockets that utilize a standoff mounted bakelite platform to mount a conventional bayonet-twist type tube socket. The filament ammeter on the early SE-1420 is a "live zero" meter with a .5-0-1.5A scale. The meter is generally marked as "CAY 260." Later SE-1420 receivers will have a DC Voltmeter rather than the CAY-260 current meter. The Westinghouse Type RB did away with the meter entirely. photo above: The U.S. Army Signal Corps BC-131 version of the SE-1420C. This example has the olive-drab painted wooden case. 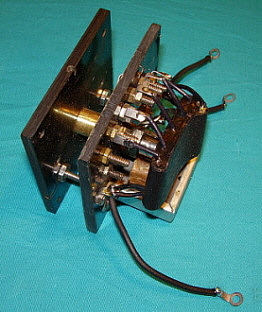 This is an AMRAD contact receiver that was rebuilt as a BC-131. The modification tag is mounted below the AMRAD tag and identifies the set as the BC-131. 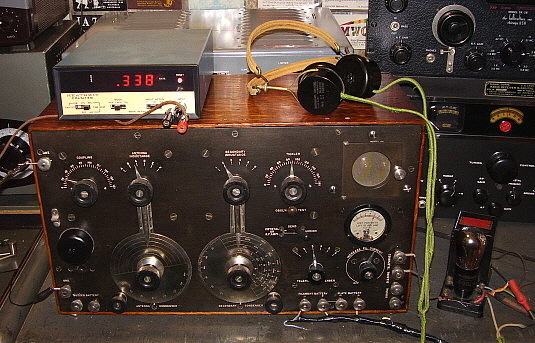 Photo from Antique Radio Classified, cover, Nov. 2006 Tube types used in the SE-1420 depended on the time period and the end user. 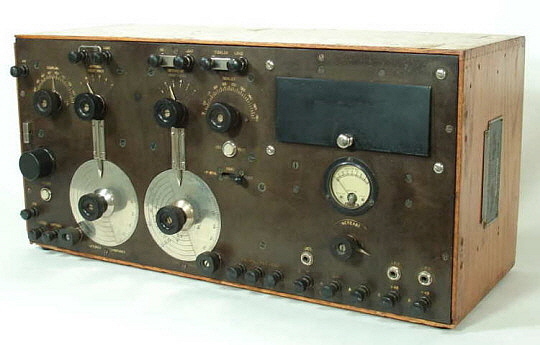 In early receivers, generally, if the Navy used the SE-1420, a Moorhead Electron Relay (ER) was used as a detector, while the Signal Corps preferred the Western Electric VT-1. There were many variations of the Moorhead ER tubes with different manufacturers building them from 1919 up to the early twenties. Both the VT-1 and the ER tubes specify filament current rather than voltage (.5A@ ~3vdc for the VT-1 and .4A@~4vdc for the ER.) There were other tubes also available, like the military triodes that had the internal structure mounted so that when the tube was operated in the horizontal position (as in the SE-1420) the actual tube structure is in the vertical position. This prevented filament sagging that could happen with standard tubes operated in the horizontal position. Later SE-1420 receivers used the 201A and these tubes specify filament voltage (5vdc@.25A) The panel meters were changed from ammeters to dc volt meters as tube use evolved. Apparently, many early SE-1420 receivers were rebuilt by the military as the receiver aged. This included upgrading the receiver to the SE-1420C or BC-131 configuration. This upgrading included adding a grid-leak resistor and capacitor assembly, usually mounted on the Secondary Inductor mount near the Tickler coil. Early versions of the SE-1420 relied on self-biasing of the detector tube and, although this does work, it requires fine adjustments of the filament and plate voltages for best results since there isn't a fixed negative bias source in the SE-1420. As vacuum tubes improved, the grid-leak arrangement worked better since it allowed for rectification (detection) and would "leak" off the excessive negative charges quickly though a high-value resistor. Several variations are seen of the replacement tube socket. The original socket is overly complex and was probably a constant source of problems. The simpler replacements are seen on rebuilt SE-1420 receivers and usually are utilizing the original stand-offs and lugs but have additional stand-offs to support a bakelite or fiber platform that has the tube socket integral with the platform. Some of the platforms seen are round, others are triangular. More than likely it depends on when the rebuild was performed, with the triangular platform being the later version. Rebuilt receivers will usually have a newer ID tag mounted in place of the original tag or sometimes just an additional tag with the rebuild information. The boxes were sometimes painted olive-drab when the Signal Corps converted the receiver to the BC-131 configuration. 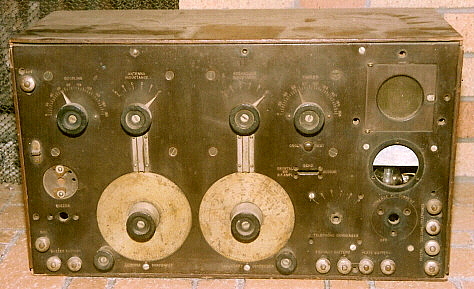 New SE-1420 receivers were built through most of the 1920s by several different contractors over the years. Shown in the photos to the right is a later SE-1420 made for the Coast Guard, the CGR-5A, from June 1927. This version doesn't have the buzzer or the circuit selector switch and is housed in a metal cabinet. Also, the dial is calibrated in frequency rather than meters. The contractor on this particular CGR-5A was National Electrical Supply Company. This version also references itself to the SE-1420C. The receiver shown belongs to C. Dockery, who has also provided the photos. photo above: The ID tag on the CRG-5A showing the contact date of June 6, 1927. The receiver was built sometime after that date. In 1907, Wireless Specialty Apparatus Company was formed by Greenleaf Pickard (who had cataloged over 1500 minerals and combinations that worked as detectors in 1903) along with Col. John Firth and his patent attorney, P. Farnsworth. John Firth also worked with Reginald Fessenden's NESCO at the same time and, probably because of this association, all WSA model numbers have the "IP" prefix which meant "Interference Preventer" - a Fessenden term for "selective tuning." United Fruit Company was an early user of WSA gear on their ships and in their shore stations. United Fruit Company had been somewhat in the radio business since 1903 and, in 1911, they bought WSA. Later, in 1913, United Fruit formed another radio company, Tropical Radio Telegraph Company, mainly for setting up and operating communications around their extensive property holdings in Central and South America. United Fruit was aware that their purchase of WSA gave them all rights to all Crystal Detector patents that WSA had through Greenleaf Pickard's association. 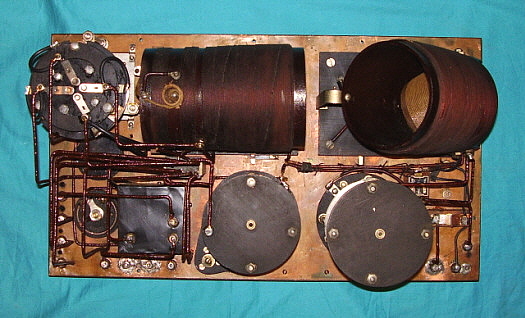 The crystal detector dominated wireless receiver operation through WWI. Right after WWI, the crystal detector patents were still of major importance and because of this patent, United Fruit Company was invited into the new cross-licensing agreement that was headed by General Electric and included Radio Corporation of America (GE's creation in 1919) along with AT&T (vacuum tube patents) and Westinghouse (Regenerative Detector and Superheterodyne patents and International Radio Telegraph Co.) With the cross-licensing agreement, these companies shared patents and products toward their advantage and tried to exclude most other companies and their competition by threats of lawsuits. The cross-licensing also allowed UF/WSA to now produce the SE-1420 for commercial users and have them sold by RCA (RCA hadn't created a division specifically to handle all maritime equipment and operate coastal communications stations - yet.). For the new commercial market, the designation of the receiver was changed to IP-501. A matching two-stage audio amplifier was now available, the Triode Type-B Amplifier. A Long Wave Adaptor was also available for operation at VLF frequencies. Though early versions may have used ERs or VT-1s, after about 1923, the IP-501 receivers used UV or UX-201-A tubes. >>> RCA handled the sales of IP-501 receivers and accessories from around 1921 until sometime in 1923. In 1923, Wireless Specialty Apparatus disappeared from the scene, apparently purchased or absorbed by RCA. It is likely that RCA also acquired the WSA manufacturing plant in the deal since all later IP-501s and IP-501-As still use WSA parts but have tags that indicate RCA-RMCA as the builder. Radiomarine Corporation of America was likely created from Wireless Specialty Apparatus around 1924 or '25. RCA's founding history allowed a separate portion of RCA's assets to be directed toward the lucrative maritime market. The Navy had stipulated in November 1919, when RCA was created, that they wanted to deal with just one company for all wireless equipment and operations (this was eventually backed-up with various laws regarding use of foreign equipment or operation of US stations.) In the early twenties, RCA was operating many of the coastal wireless stations and providing "Radiogram" communications. With the formation of RMCA, all marine operations and sales were then transferred to Radiomarine Corporation of America as a division of RCA. By 1930, RCA had acquired most of the patents and power that had formerly been shared by the GE-Westinghouse-AT&T Group as part of a settlement of an Anti-trust suit brought by the government. That resulted in the consolidation of RCA into the omnipotent corporation that controlled everything in radio in the thirties and forties. 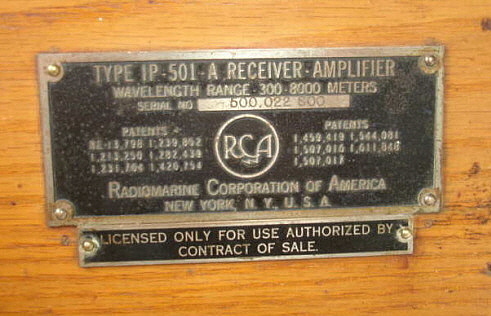 By the thirties, RMCA was running many of the coastal marine stations that provided Radiogram service to ships at sea. RMCA built marine radio gear that was installed on commercial ships. During WWII, RMCA supplied the Liberty ships with radio gear. Around the mid-1960s, RMCA was eliminated as a division and RCA handled all of the maritime business directly - at least, what was left of it. United Fruit Company went on to political involvement in some Central and South American countries in an effort to protect and/or enhance their extensive banana and pineapple properties. UFC was usually accused of neo-colonialism (or worse) in their political involvements and their power waned after WWII. Eventually, United Fruit Company merged to become United Brands (in 1970) and then was reorganized in 1984 as Chiquita Brands International. The photo left is a close up of the ID tag of an IP-501-A showing Radiomarine Corporation of America as the builder of the receiver. This tag is from the receiver shown in the photo right - a beautiful later version of the IP-501-A. This receiver is probably from the 1924 to 1926 time period. Note that the telephone condenser switch was eliminated and bakelite capped binding posts are used on these later receivers. One look into the SE-1420, the IP-501 or the IP-501-A reveals an approach to construction where reliability was a major consideration, along with superior performance and ease of operation. The receiver uses a three-circuit tuner with regenerative/autodyne detector. The IP-501-A includes a built-in two-stage audio amplifier. The Antenna Tuner and Secondary Tuner circuits and the Detector circuits are similar in all receivers. The Antenna Tuner is labeled "ANTENNA INDUCTANCE" and "ANTENNA CONDENSER." The condenser is gear driven and the dial is calibrated 0-180º on its graduated scale. The Inductance taps are switched, "dead turns" are shorted to ground and an articulated pointer shows which band or scale is used. 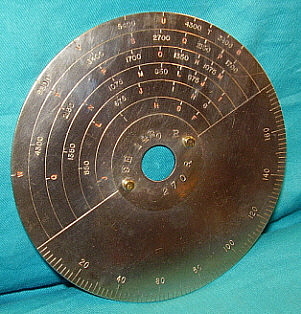 The Antenna Condenser dial has no nomenclature other than the 0-180º scale and ample room was provided on the upper non-scaled area for the operator to write in any markings he needed. The "COUPLING" control rotates a small coil located at one end of the Antenna Coil. The wires from the Coupling Coil are placed next to the front panel shield and then routed through a small opening at the base of the vertical shield that divides the cabinet into two shielded compartments. Only the energy within the variable Coupling Coil is transferred to the Secondary Tuner circuit. The shielding provides complete isolation and eliminates stray pick-up or any hand-capacity effects when operated as an autodyne detector. What comes down the antenna and is tuned in the Antenna Tuner circuit is then variably coupled into the Secondary Tuner circuit. This provided the excellent selectivity necessary for operation of the receiver in the presence of nearby spark and arc transmitters. In some photographs, it appears that the first SE-1420 receivers may not have had a calibrated "SECONDARY CONDENSER" scale other than the 0-180º scale. If this was the case, it wasn't long before a meters calibrated dial scale was incorporated. That was followed by a dial with a meter scale and with important wavelengths marked off with letters. This must have been in reference to military wavelength assignments designated with letters because the SE-1420 lettered scale runs from "F" = 300 Meters up to "W" = 7500 Meters. The lettered scale is red while the meter scale is black. Late SE-1420 receivers, e.g. CGR-5A 1927, had dial scales calibrated in frequency rather than meters. photo left: Secondary Condenser dial from an SE-1420B receiver showing lettered scale. Also note that the receiver serial number is on the dial, "270-R."
The detector is a regenerative type using a variometer and tickler load winding on the secondary coil. Variometer controlled regeneration relies on tuning the detector plate circuit (with the variometer) to resonance with the grid input frequency. The feedback path is by way of the detector tube's interelectrode capacitance. For reception of damped wave spark transmitters using rotary gaps the "TICKLER" is adjusted to a setting just before the oscillation point. If an arc transmitter was to be received then the "TICKLER" can be set into oscillation to allow a heterodyne action (autodyne detector) to hear the arc signal since it is continuous wave or CW. For the reception of a voice transmission via AM, the "TICKLER" would be set to just before oscillation occurs. The greatest sensitivity and selectivity occurs just at either side of the oscillation point in a regenerative detector and that is usually where the operator would adjust his "TICKLER." Since the load on the "TICKLER" (plate variometer) is fairly constant (because of the Antenna Tuning) there is very little change in where the "TICKLER" is set until the receiver is operated below 100kc. Since the regeneration is tuned, lower frequency reception requires a little more total variometer inductance so the "TICKLER" control will have to be increased (higher on the scale) as frequencies below 100kc are tuned. The "TICKLER" tunes total inductance in 180º of rotation but, depending on the receiver, all "TICKLER" action is usually centered around 45º and increases to 90º as the lowest frequencies are tuned. The push button switch labeled "OSCL'N TEST" is for testing if the detector is actually oscillating or not. If the button is pushed and the detector is oscillating a "click" will be heard in the earphones. No click means the detector is not oscillating and the "TICKLER" control needs to be adjusted. Detector tube is normally a UV/UX-201-A. Photo above: Inside the RMCA IP-501-A showing the heavy-duty construction of the receiver. The Coupling coil can just be seen inside the Antenna Coil, far right. Note the Ni-Chrome resistors wound on the bakelite wire terminal carrier over the tube socket assembly. The Telephone Condenser switch, the condensers and the choke are contained inside the black metal box next to the Secondary Condenser. Mid-production receivers use black sleeving over the buss wiring. photo above: Inside the WSA SE-1420 showing the same heavy-duty approach to construction used in all of the shipboard receivers. Note that the SE-1420 shielding is not plated but is bare copper sheeting. Early receivers use a reddish-brown sleeving over the buss wire. See text in "Restoration" section regarding the black metal boxes that are covering the Telephone Condenser switches in both our SE-1420 and IP-501-A. 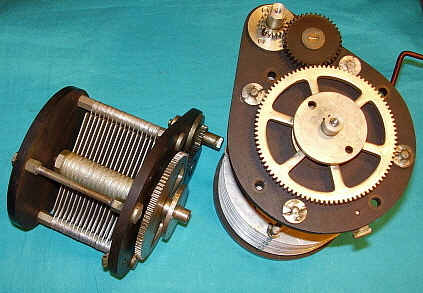 photo above: The Antenna Condenser (r) and the Secondary Condenser (l) from an SE-1420 receiver showing the gear drives. Note that the idler gear is fiber so no lubrication in required and it is also insulating the main drive gear from the fine adjustment gear. photo above: The Antenna Tuner section of the IP-501-A. Note the gear drives on the Antenna tuning condenser. Also, the Buzzer coupling to the Antenna circuit can be seen (the wire coil wrapped on the antenna inductance wiring.) The fixed condenser connects B- to ground (shielding.) The fixed condenser is a .012uf Faradon - the WSA/RMCA brand name. The audio amplifier circuit used in the IP-501-A is a standard two-stage type using interstage transformer coupling. The AF interstage transformers are typical RCA units and probably were products of that company. The ratio is around 3.5:1. Tubes normally used were UV/UX 201-A. There are ni-chrome windings on the bakelite wire carrier of the tube socket assembly. These provide about 1ohm resistance in the filament line to each tube as filament protection in case one of the tubes was removed with the A+ on. C bias voltage is used on both AF amplifier grids. The AF amplifier plates are usually run at 90vdc B+ and the C bias is usually -4.5vdc. The Detector plate is run at 45vdc B+. Filament control telephone jacks are used for output and the three provided allow for Detector only, Det.+1AF or Det.+2AF operation. Insertion of the 'phone plug into one of the jacks will determine which tube filaments are lighted. A panel meter shows the applied filament voltage which is adjusted with the control "INCREASE." On SE-1420 receivers, the panel meter measures current drawn by the detector filament. It was changed to a voltmeter early in the IP-501 production. 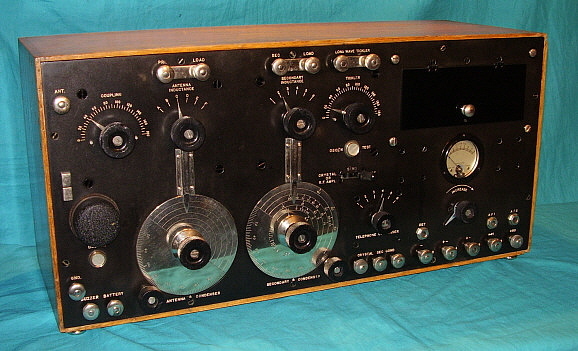 The early versions of the SE-1420 are wired with the input ground "floating" and tied to the shield and B- through a fixed capacitor. This was changed in later versions to have the shielding connected directly to the input ground and then the B- connected to the shield through a fixed capacitor. The "TELEPHONE CONDENSER" switch allows selecting various values of input capacitors to the RF pi-filter that is connected between the output of the TICKLER variometer and the audio output line. The RF pi-filter also uses a series iron core choke and a fixed output capacitor. The selectable input capacitors allow varying the audio response, specifically rolling off the high frequency audio. This is particularly effective for relief from static and other atmospheric noise. This function is only on the WSA versions of the SE-1420. It is also on the early versions of the IP-501 and IP501-A. The TC switch was never used in the AMRAD SE-1420 and was eliminated from the later versions of the WSA receivers. The TC switch was really not a necessity. It was probably installed on the WSA receivers for shipboard operation where static and antenna noise can hamper reception. RCA/RMCA eventually eliminated the TC switch, probably because of expense, potential problems and the fact that an optimum fixed-value capacitor resulted in effective static relief along with increased reliability by eliminating the switch. The SE-1420, IP-501 and the IP-501-A all provide operations with crystal detectors utilizing the low-capacitance lever switch labeled "CRYSTAL OR R.F.AMPL" - "SEND" - "TUBE" ("AUDION" on SE-1420 sets.) Usually the standard crystal detector used was the "Three Detector Stand" that WSA offered. Typical shipboard operation had to provide for the possibility that all of the vacuum tubes, those in the set and the spares, could be destroyed during wartime with a possible torpedo hit. There was also the possibility that given enough time and bad luck all tubes and spares might just fail while still at sea. Or, maybe the batteries might need charging or replacement and there were no spares. In other words, many different things could affect whether or not the vacuum tubes could be used. The crystal detector was the back-up and it always would work. The "BUZZER" provides a "signal generator" of sorts. When looking for a sensitive spot on the crystal detector, it would help if a really loud signal was present. Pressing the buzzer button will actuate a small mechanical buzzer that arcs and creates tremendous wideband RF. This is coupled into the antenna circuit with a brass sleeve capacitor on the wiring to the Antenna Inductance switch on SE-1420 sets and by a wire coil wrapped around the same wiring in the later receivers. The buzzer battery is usually a 1.5vdc dry cell battery. It's not critical, but 2vdc was considered the maximum for the buzzer. DO NOT PRESS the buzzer button (with Buzzer battery connected) while in the vacuum tube mode of operation - if you do and you're using 'phones in the AF2 jack, the resulting "signal" will be so intense that you probably won't be able to hear anything for a few minutes afterward (yes, I did it.) The Buzzer circuit was only for finding a sensitive spot on a crystal detector. Additionally, a Long Wave Adaptor was sometimes used if operation below 40kc was needed. This unit sat on top of the receiver and its connections match the binding posts located at the top of the panel on the IP-501 and the IP-501-A (the Long Wave Adaptor units were not used with the SE-1420.) 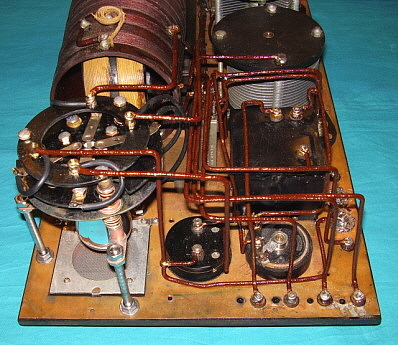 The Long Wave Adaptor had series inductors inside that when connected allowed the receiver to tune down into the VLF part of the spectrum. photo above: The Secondary Inductor switch assembly. Tickler control is on the right. Note the vertical gear-driven "lifter" for the dial pointer. The wooden shaft under the TICKLER control is the OSCL'N TEST button. This unit is from our SE-1420 receiver. Photo above: The copper shielding inside the IP-501-A cabinet is painted black. 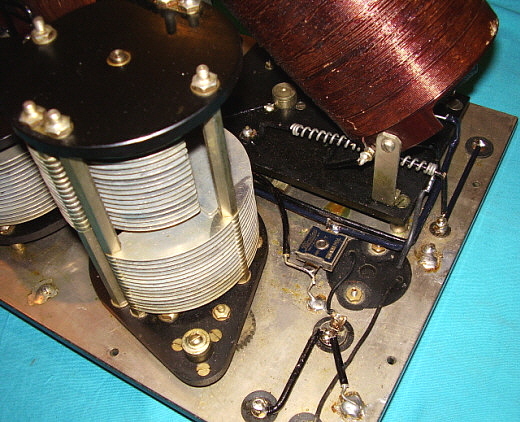 Note the divider shield and the small notched opening that allows the two wires from the Coupling Coil to pass through to the Secondary Tuner. Also note that the tapped screw mounts that allow the panel to be mounted are connected to the box shielding and these mounts also contact the back panel shield for a completely shielded enclosure. The oak box that the receiver is mounted in is entirely lined with copper sheeting to act as the shielding. Complete contact is assured by way of the metal screw mounts that contact the receiver's panel shielding. 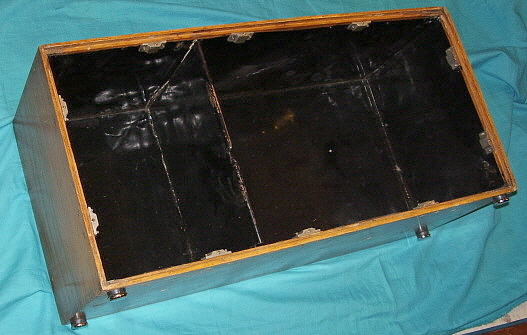 Early receiver boxes sometimes had a front cover that was held on with bale clamps. The ID tag is located on the side of the box and these are almost always missing. This was probably due to the "military surplus" regulations of the time that required all mil-tags to be removed before sale. Something about if the tag wasn't there then the unit wasn't stolen. This regulation may have also applied to commercial surplus. Weight of the box with all of the copper inside is substantial and the entire receiver is quite heavy for a battery operated receiver - about 40lbs for an IP-501-A. 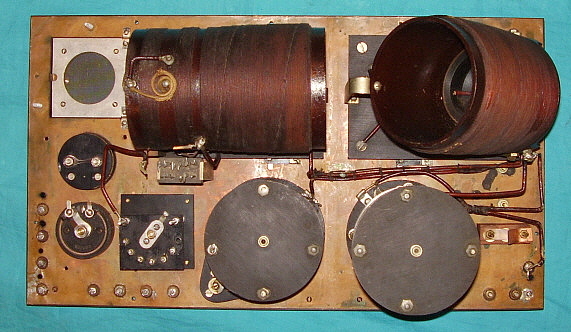 The box for the SE-1420 is similar in construction but the shielding is not painted and is left bare copper. The finish on the SE-1420 box is somewhat dark, usually about the color of "iced tea." The later IP-501 and IP-501-A receiver boxes are finished in golden oak. Most BC-131 boxes are olive-drab paint. The front panels are .312" thick and is made of "Hard Rubber" sometimes called "Condensite" or "Bakelite-Delecto." This material is not brittle like bakelite or formica. The manuals say that the panel can be wiped with oil to protect it. 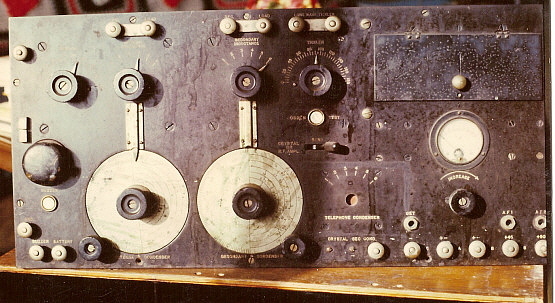 Probably, with all of the salt-air present onboard a ship at sea, wiping oil on the entire panel, dials, knobs and cabinet would have gone a long way to protect the receiver's overall finish. All screw and nut connections in the receiver are tightened and then soldered. This method is also used on the mechanical assembly. Soldering is easily accomplished since all of the hardware is nickel plated brass. This securing of all joints with solder was necessary because of the constant vibration of the ship while at sea in addition to adding protection from salt-air corrosion problems. The solder joint itself is not particularly strong and can easily be disassembled, however, much like modern "lok-tite," it was meant to keep the screws and nuts secure after tightening. Restoration shouldn't be desired or even considered if your receiver is complete and original. However, this is by far the minority of surviving SE-1420, IP-501 or IP-501-A receivers. Most of these great receivers were destroyed in the past 80+ years by scrap dealers, by the scrap drives of WWII, by parts dealers, by surplus dealers selling to "hamsters" and just by years of abuse, poor storage and neglect. This section is for the restorer that wants to have his incomplete receiver as accurately restored as possible and to have it operational and functioning correctly. 1. Both Antenna and Secondary Inductors - including Coupling Coil and Tickler Coil. The Inductors are bank-wound Litzendraht wire and have multiple layers and taps that are wound on machine grooved forms - difficult to replicate. The Inductor switching is also a complex assembly. 2. Both Antenna and Secondary Condensers - complete with gear drives. These condensers are also very complex assemblies. 4. Cabinet and cabinet shielding - though the receiver will operate without the cabinet, it's complete shielding is an important part of the design. Most of the other parts can be found or replicated. Some parts are not too difficult to find even today. You will probably have to adapt some of the parts from 1920s TRF battery radios. Many times these are the exact same parts anyway. Knobs can be cast or professionally reproduced. Hardware can also be machined and nickel plated. The amount of work necessary is sometime daunting but patience is required when restoring 80+ year old receivers. Documentation is very important when restoring the SE-1420, IP-501 and IP-501-A receivers. To say that they were poorly documented would be an understatement. None of the schematics available are complete. Most will provide a general idea of how things are connected but details are certainly lacking. 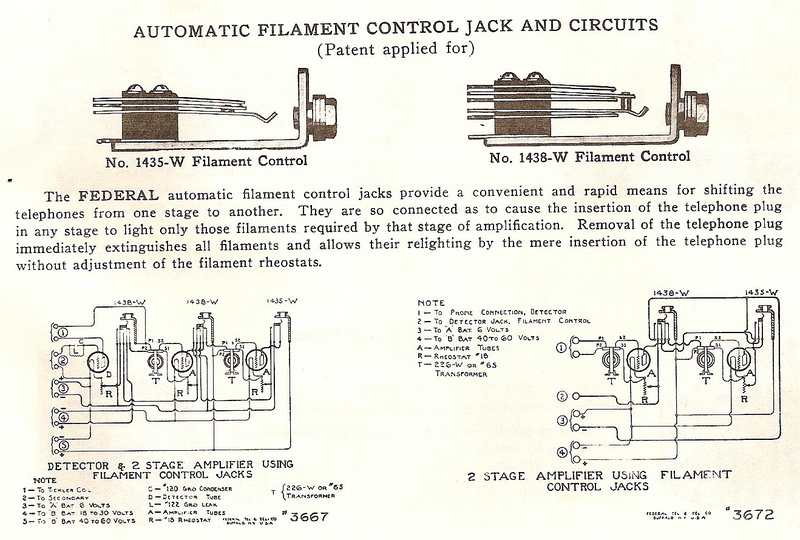 The various schematics are shown in several books, e.g., Elmer Bucher's book on Wireless Equipment or early editions of George Sterling's Radio Manual or others, but all are incomplete schematics that are only provided as general information. The IP-501 schematic shown to the right is about as good as they get. Not a lot of details but it is basically complete and does show the connections to the complicated "Circuit Selector" switch. However, mistakes are common, e.g., the "Grounding Condenser" is not a variable, it is a fixed condenser. 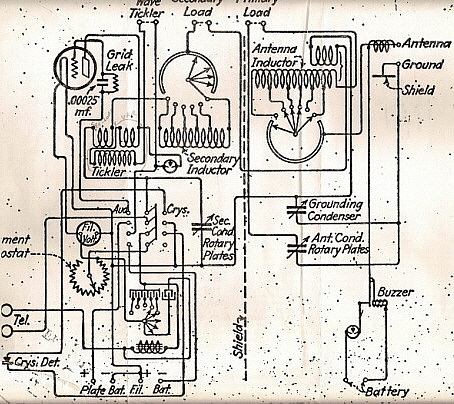 This schematic is good for the IP-501 produced around 1922. Earlier SE-1420 and the later IP-501-A are very different receivers. What one has to do is use good photos of the interior of original receivers combined with the information provided in the better schematics to ascertain what is correct for your particular receiver. This is assuming that your receiver needs to be restored and is missing some of the original buss wiring or original components. 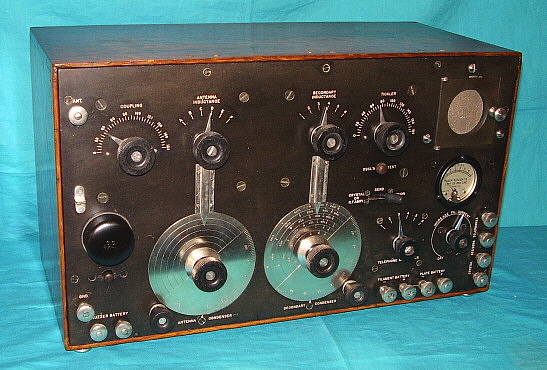 Be aware that the buss wiring techniques and routings changed over the production period, so early receivers look very different inside from the later versions of the same model. Interior photos are the most helpful to determine what is correct. Operator's manuals are around. Some are available on the Internet and some basic operating instructions are included in various books. Sterling's Radio Manual has instructions for both the SE-1420 and the IP-501, along with the Long Wave Adaptor. However, these instructions are brief, contain very few details and are not very accurate anyway. No details are provided about typical antennas for the receivers. The RMCA manuals are the best and are accurate. Synchronizing the Tickler Variometer - The variometer has to increase total inductance with the proper sign (+ or -) as the pointer is advanced up the TICKLER scale. This results in the receiver requiring higher TICKLER settings as the wavelength is increased (lower frequency.) The correct wiring is the detector plate is connected to the variometer stator input and the variometer rotor output (rotor-front) goes to the Circuit Selector Switch, RF pi-filter and on to the audio output and detector B+. To check that the variometer is synchronized, place the TICKLER pointer straight up on the scale. Look at the variometer rotor just visible on the shortwave side of the Secondary Inductor - you should be able to see the wire splice joint that connects the two rotor inductors together. If you don't see the splice joint then the rotor is 180º out. Remove the TICKLER knob and pointer, then rotate the variometer rotor so that the splice joint side is visible, then re-install the knob and pointer with the pointer straight up on the scale (or nearly straight up.) Check the flexible connections on the variometer rotor to make sure they aren't coiled too tight at each extreme of TICKLER adjustment. NOTE 1: Although you do get a change of total inductance through each 90º of rotation with a variometer, the two 90º quadrants in 180º of rotation are of opposite sign (there is a mutual inductance change also.) When the variometer is operated in the opposite two 90º quadrants, the receiver will not regenerate on lower frequencies or will oscillate uncontrollably. With the proper variometer synchronizing the receiver's oscillation is controllable on all tuning ranges. NOTE 2: Some receivers (early SE-1420s) will have the variometer rotor mounted slightly off so that the angle of rotor rotation is not 0-180º. This was probably to allow the TICKLER adjustment to be more "mid-scale." Later receivers have 0-180º rotation and most of the TICKLER action is located in the 0-90º portion of the scale (as would be expected.) This allowed plenty of regeneration at the lowest frequencies that the receiver would tune to since this was about mid-scale (90) on the TICKLER adjustment. Dismounting the Antenna and Secondary Condensers - The condensers are mounted using 10-32 screws and nuts with stand-offs between the condenser mounting plate and the back of the panel. The nuts are secured by soldering after assembly. To remove either condenser first remove the associated fine adjustment knob and the dial by removing the large knob and collar, then remove the dial. The dial is only held in place with two locating pins and should easily come off. You will now see that the flange that the dial mounted to will just barely fit though the hole in the panel shield. You have to be careful not to bend the shielding too much when removing the condenser otherwise you will end up shorting the condenser to the shield when reinstalling the unit. Unsolder the buss wire connections to the condenser. Then remove the screws and nuts. The soldered nuts will come off easily. Solder is not particularly strong and usually with a open-end wrench on the nut and a large screw driver on the screw head, the solder joint comes loose with minimum effort. You can also heat the joint up with a larger soldering gun or iron and then break the joint loose. Heated solder is even weaker and the screws will loosen with almost no effort. After the screws and nuts are off, carefully rotate the condenser assembly while lifting it off of the panel. You will find some interference between the panel shield and the dial flange but by rotating the assembly, the flange will clear the shield hole. Be sure to check the shield hole for bends - it should be straight and even with the back of the panel. Be sure to keep track of the four stand-offs. Remount in the reverse order. Dismounting the Antenna and Secondary Inductor Assemblies - Fortunately, the inductor assemblies are held to the panel with 10-32 flat-head screws that are not soldered. They screw directly into threaded stand-offs that are mounted to the assemblies. Remove the associated knobs and pointers. Disconnect the buss wires going to the inductor assembly. Remove the four 2-56 screws that hold the dial pointer cover-guide to the panel. The pointer has a .125" diameter pin that is a push-fit into the lifter mechanism behind the panel. Remove the dial pointer. The pointer should be slightly twisted while pulling it away from the panel. The pin fits into a bakelite holder, so it should come off with very little effort. Remove the four 10-32 flat-head panel screws and lift the inductor assembly from the panel. Remount in the reverse order. Dial Pointers - These are rather complex assemblies for the simple job they do. The "lifter" mechanism is located on the associated inductance assembly. The lifter is gear driven by the inductance switch and the lifter itself is attached to a rack gear. Two guides keep the rack's alignment. The lifter has a "L" shaped bakelite piece that the pointer pin is inserted into. The pointer itself is mounted to the front panel by a two-piece cover-guide that is nickel-plated. The cover-guide is mounted to the front panel with four 2-56 round-head machine screws. To remove the pointer just take out the four guide screws, remove the cover-guide pieces and remove the pointer from the lifter by pulling it away from the panel. If you need to work on the lifter mechanism itself, you will have to remove the associated inductance assembly. Buss Wire Details - Buss wiring changed as production methods evolved. 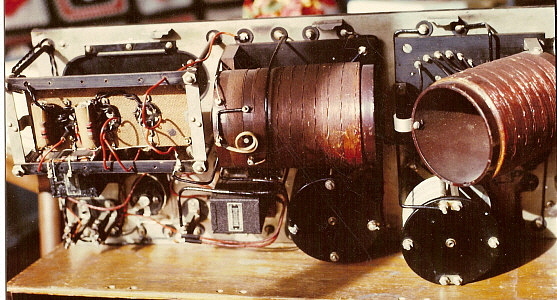 The early SE-1420 receivers use a reddish-brown varnished tubing (spaghetti) for insulation. The wiring style for these receivers is very square and the buss wires actually run much longer than necessary. This was for appearance and was typical of the style of wiring at the time. When the IP-501 and IP-501-A were being produced by RMCA, the varnished tubing was changed to black. The style of wiring also changed in that the runs are much shorter and though still somewhat square looking, there are some angles and bends that are for better durability or performance rather than appearance. The late IP-501-A receivers still use black varnished tubing but more and more the square-look is giving way to more direct connections. Finally, in the 1927 CGR-5A (SE-1420C) the spaghetti is entirely eliminated and enameled buss wire used. When replacing missing buss wire, try to find an interior photo of a comparable receiver for reference. Buss wire was usually 13 gauge tinned-copper, which is impossible to find. I have used 14 gauge and 12 gauge, both work fine, although the 12 gauge is more difficult to work. Before using either size, the wire should be "drawn" - that is stretched by anchoring one end and then pulling the other - hard. This straightens the wire and slightly reduces it's diameter. It will make the buss wiring look very straight and professional. 1919 - RCA is formed from GE assets and purchase of American Marconi Co.
1923 - Likely formation of Radiomarine Corporation from WSA assets. Back in 1979, I bought this IP-501-A from a ham friend who had traded a telephone pole for it. The price of $75 took into consideration the substantial amount of work that was going to be required to restore the set. Back then, with no Internet, all parts had to be advertised for in Radio Age magazine with the hope that one of the many collector-readers might have what you needed and would be willing to sell the part. It wasn't unusual for part locating to take a year or more. The IP-501-A was missing almost all of the buss wiring, it had the incorrect AF transformers, the Telephone Switch was gone along with the correct tube socket assembly. Additionally, the set's front panel was in pretty rough condition as were all of the nickel-plated hardware parts. The cabinet was actually in pretty good condition and the parts that remained were also in good condition. My first restoration just got everything cleaned up and looking good but I didn't want the IP-501-A to be just a "shelf queen" so I began to advertise for specific parts I needed to get it operational. That resulted in the second, functional restoration. I used black plastic tubing for the "spaghetti" on the new buss wiring and the interstage transformers were two old Jefferson units. I had to make several parts. I made the tube socket assembly from .25" thick original vintage bakelite. The nickel-plated tube socket shells came from an old TRF battery set. One small knob had to be cast in epoxy resin with black filler so it would come out looking like hard rubber. The metal parts that had to be made were two binding posts and one knob pointer. I got the IP-501-A running and eventually wrote an article on it for Radio Age (April 1984 issue.) Don Patterson (editor for Radio Age) sent me some material on the IP-501-A that included an article written on the IP-501-A receiver back in the 1960s for Popular Electronics. The article had a good photograph of the inside of an original IP-501-A, something I had never seen before. photo above: The IP-501-A as I received it before any work was performed - April 12, 1979. This photo shows the deplorable condition that the front panel was in. Since the front panel is hard rubber, it is easy to aggressively clean it with soapy water and 0000 steel wool. It sounds harsh but the panel can take it and this cleaning method removes all of the staining that is usually found on these receivers. photo above: As received April 12, 1979. This photo shows how much was missing inside. Note that most of the buss wire is gone, the non-original tube socket assembly is made out of masonite, the AF transformers are Ferranti units. Luckily, the meter, the filament pot, the phone jacks and the tube socket frame were original parts. See photos in the above sections for what the restored interior looks like. My second restoration had been incorrect in several places and needed to be redone to be an accurate representative of the IP-501-A, both physically and operationally. I started to search for more parts for the new restoration. The easiest to find were the two RCA audio interstage transformers. The new buss wire used was now 12 gauge (I had used 14ga. before) which also was easy to find. The lacquered tubing or "spaghetti" was a reproduction product supplied by one of the few dealers then around and doing business. It looked very close to original. The Condenser Switch and assembly was rebuilt from correct vintage parts and then installed in a painted black, brass metal box I made. All of the hardware on the front panel was removed and then cleaned and re-nickel plated. The tuning dials were listed originally as "German Silver" but that is really just a fancy name for heavy nickel plating. In order to have all of the hardware parts match, since some were new repros, I had to re-nickel plate all of the hardware. That way it all matches and looks the same vintage. Disassembly is difficult because all screw and nut assemblies are soldered. The technique for removal is to use the soldering iron to heat the solder and nut, then while the joint is still hot use a nut driver to remove the nut. While hot the solder isn't very strong and the nut will back off with very little effort. Clean the screws and nuts before reassembly for better solder flow. This last restoration was done in 1984 and resulted in the IP-501-A looking original and functioning as it should. Or did it? I found that I could not get the receiver to oscillate below about 250kc no matter where the TICKLER was set. Reversing the variometer leads got the receiver to oscillate but the wiring layout didn't match photos of original IP-501-A receivers. I finally revised the way I had done the buss wiring which then allowed the variometer stator input to connect to the plate and the front of the variometer rotor to be the output. This got the IP-501-A looking correct inside and working the way it should - able to regenerate down as low as the receiver would tune. I bought this SE-1420 from a fellow in Louisiana who had advertised it in Antique Radio Classified magazine in 1990. He had listed the radio as a "Radiomarine Corp Receiver." I was curious as to what it was so I called and asked him to describe the receiver to me. When I heard "...,two large metal dials, lots of metal binding posts and an oak cabinet...," I was sure it was an IP-501 receiver. The price of $150 plus shipping took into consideration that the receiver was nowhere near complete and had been extensively modified by someone, circa 1940s. The seller described all of the modifications and indicated that no major holes were drilled and the coils and condensers were present. When the SE-1420 arrived I found he had described it very accurately. The most important parts to have present on these types of receivers are all of the coils, condensers, bandswitches, dials and cabinet. Most of the other parts can be found or replicated. It seems to be common to find these types of receivers with most or all of the buss wiring missing. Also, many times they are found with conversions to later vintage tubes. Most of the time this is the work of "hamsters" (radio amateurs who are too eager to modify vintage equipment into something it was never intended to be.) 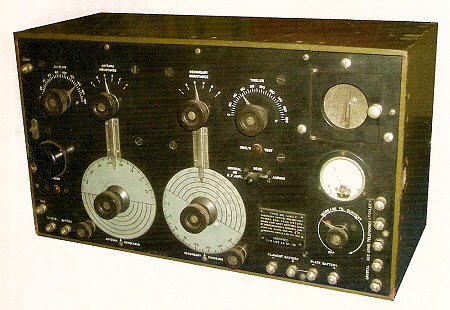 The SE-1420 family was available surplus in the late thirties and most of the modifications seem to date from that time period. The early versions of the SE1420 have a complex, spring suspension tube socket mounted on long standoffs. Later versions eliminated this over-designed, expensive-to-build socket with a simple bakelite platform and standard bayonet-twist type socket. The elaborate suspension socket has an incredible 77 total parts to the assembly, including 12 conical springs and dozens of nuts, washers and screws, not to mention the three mounting rings that hold everything together. There are 21 parts just in the three standoffs that mount the socket to the panel. I delayed restoring the SE-1420 beyond "shelf queen" for almost twenty years - mainly because of the difficulty in replicating this socket due to a lack of detailed information. Over the past several years, I collected various vintage photos that showed the spring socket from various angles. Finally, in 2009, I had enough information (and interest) to go ahead with building a replica spring socket (and hopefully completing the SE-1420 restoration.) Building any multi-part assembly is certainly made more difficult when a physical example is not available to examine and measure, or a detailed mechanical drawing doesn't exist. Using five vintage photos I was able to use proportional measuring to determine the size of the various parts that comprised the tube socket. This method involves measuring existing parts from my SE-1420 and then measuring the same parts in the photos to determine scale and then extrapolating what the measurements of the socket parts should be. I created several scale and non-scale drawings to "figure out" how this over-designed mechanism was going to work. photo above: The SE-1420 as received in 1990. A former owner's modifications can be seen through the meter hole in the panel. The mod consisted of a metal chassis to hold a one-volt battery tube detector. As with most modifications, this one did not function. Visible missing parts are the buzzer, the buzzer button, the filament control pot, the filament meter, the Telephone Condenser switch, the knob on the tube access door, the audion/xtal switch and the spring suspension tube socket. Also note the condition of the dials which had some surface corrosion and the numerous chips of missing material on the cabinet edges. Although it looks like a lot of restoration work, this is typical of how many of the SE-1420 receivers are found today. photo above: The inside of the SE-1420 before restoration with the modifications stripped out. Where's all of the buss wire? Also, obviously absent is the complex spring-suspension tube socket,....Bummer! The Telephone Condenser switch, the meter, the buzzer and the filament potentiometer are not correct original parts either,...More work! A template to check size and fit was necessary and was based on the dimensions of the three mounting holes in the front panel of the receiver. Also, using proportional measuring, the total height of the assembly was determined and where each "ring" should be positioned. Finally, the height of the socket had to also take into account enough clearance for any type of vacuum tube that might be installed. Typical SE-1420 tubes were either Moorhead Electron Relays (ER), similar Atlantic-Pacific types or the Western Electric VT-1. I also wanted to be sure that I could install a common UX-201A and still be able to close the tube access door. I had a local machinist make the standoffs, the shouldered screws and the metal base plate based upon my drawings. I made all of the bakelite pieces and the tube contact pieces. The socket shell and tube pin contacts were from a 1920s battery radio and found in the junk box. Assembly was fitted together to check everything and then, when I was sure of proper fit, the brass screws and nuts were soldered. This duplicated what was normally found in shipboard receivers and was done to prevent assemblies from shaking loose during the constant vibration encountered while at sea. I had to fit brass spacers (like thick washers) inside the springs to keep them centered. From the vintage photos, it appeared that the main support springs had extension spacers. I soldered brass extension spacers to the springs where necessary. The bakelite wire carrier ring has rubber insulated wire connections coming from the tube pin contact strips. These were routed as seen in the vintage photographs. photo left: Some of the parts necessary to replicate the SE-1420 tube socket. 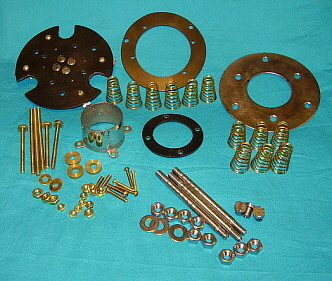 A total of 77 parts are required to build the socket. Unlike the tube socket, I was not able to find a good photo of the Telephone Condenser Switch. This switch assembly is only in the WSA versions of the SE-1420. Most vintage photos of the receiver interior are of the AMRAD versions. I decided to make a Telephone Condenser Switch that looked vintage and would appear basically correct, though not a true "replica." First I had to make the switch itself. The spacing of the six positions is not standard - at least by today's standards for 12 positions in 360º rotation, or 30º spacing. The TC switch is about 18º, or 20 positions per 360º rotation. I did a layout having 18º spacing on a bakelite mounting plate and using vintage contact points built up the six-position switch. The front mounting plate acts as a bearing for the 0.5" diameter shaft and also allows the switch assembly to be mounted to the receiver panel utilizing the original mounting holes. The capacitors and choke that are also part of the TC switch assembly are mounted to the rear of the switch plate. The three connections are via rubber insulated wires. Since the capacitors and choke are not 1920s vintage parts (new caps and 1950s choke) a metal cover was fabricated to fit over the switch assembly and terminals were placed on the back of the cover for connection to the receiver's buss wiring. The original buss wire in the SE-1420 is 13 gauge tinned copper - next to impossible to find. I used 12 gauge bare copper that I had "stretched" by anchoring one end and pulling on the opposite end. This straightens out the wire and also slightly reduces it diameter. I had to make the varnished "spaghetti." I found some vintage fabric tubing but it was bright yellow in color. Using artist's acrylic paint, I mixed up a small quantity of paint that matched the few remaining original sleeved wires. To install the buss wire you first must decide the route your wire is going to take, then measure and cut the buss wire. Next the "spaghetti" tube has to be cut to length and placed over the wire. Then all of the bends are put in place using either your fingers for the longer bends or needle nose pliers for shorter bends. The next step is to paint the wire sleeve the correct color and let it dry. This only takes about 5 minutes, during which time another buss wire can be cut and gotten ready. photo above: The inside of the Telephone Condenser Switch showing the contacts, capacitors and choke. photo above: A close up from a different angle showing the buss wiring, the TC condenser switch and the tube socket after installation. When the paint is dry the wire can be installed. In examining photos of original SE-1420 interiors, the buss wiring bends were not perfectly square. This work was all done by hand when originally installed, so some variations are normal and to be expected. I based my wiring appearance on a vintage photo of a WSA SE-1420 interior. After all of the buss wiring is installed, start applying "amber shellac" to the sleeving with a small brush. Several coats are necessary for the "spaghetti" to take on the appearance of old sleeving. "Patina" is a very important part of replicating old parts. I deliberately left the washing residue on the tube socket and also judiciously added scratches and marring to the TC switch box paint. I used a chemical "patina" to darken solder joints and to darken the brass parts of the tube socket. This imparts the impression that one is looking at original parts, original soldering - a true vintage replication. I did install one upgrade to the SE-1420 which was a grid-leak RC to improve performance with 201A tubes. This was a common upgrade done by the military in the early-twenties as vacuum tube performance evolved and improved. The top of the SE-1420 cabinet was severely water damaged. The oak wood was almost rotten and all of the original finish was gone long ago. Fortunately the bottom still had some original finish left for matching the color. The early SE-1420 cabinets are darker than the later IP-501 receivers. The good finish on the bottom was about the color of "iced tea." I had to remove a lot of damaged wood from the top by heavy sanding. This damaged wood was soft and came off like coarse wood fibers until I finally got down to undamaged wood. There were many, many holes drilled in the case over the years. I filled these with wood filler. The rest of the case was in good shape and only needed minor touch-up. After one coat of finish, I touched up all of the "filled holes" with artist's acrylic mixed to match the finished color. This way grain can be painted in on the filled holes and they will blend in with the rest of the wood. I finished the case in amber shellac and boiled linseed oil. This probably wasn't original but it can easily be removed if I ever do find out what was used as the original finish. The finish is deliberately left "flat" - no gloss - to give the impression of originality. photo above: The SE-1420 during testing. The receiver is on (note filament meter) also filaments of the 201A tubes can be seen. The Pilot Radio Redi-Blox single stage AF amplifier is on the right. The 'phones are Baldwin Type E "Super Sensitive." 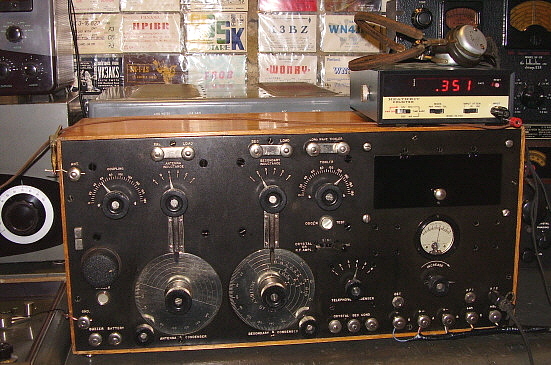 The receiver is tuned to PBT 338kc (as seen on the frequency counter.) PBT 338kc (called Proberta) is located in Red Bluff, California. Details on using a digital frequency counter for an accurate frequency readout are included in the section below "Operating the IP-501-A." The initial testing of the SE-1420 was pretty exciting. After all, here was a receiver that I had purchased nearly twenty years before. It had started out as really nothing more than just the basic necessities for rebuilding. I'm sure this poor SE-1420 had not been operational since it was "hamstered" back in the late thirties or early forties and now here it was - almost ready to operate once again. I decided to use a UX-201A as the testing tube and connected up 6vdc for the filament voltage (adjust to ~5vdc with filament control) and 45vdc for the detector plate voltage. I used the ham station tuned dipole antenna with the feedline shorted and ham station ground system. The initial test was on the AM BC band since signals there are very strong. As soon as the voltage was applied the SE-1420 started to "squeal" through the earphones - a really good sign for regenerative receivers. Backing the TICKLER down brought in the local (Reno) AM BC station on 920kc. A slight tuning of the Antenna Condenser had that station coming in strong in the "Baldie" earphones. I tuned in a few more AM BC stations with very good results, so now it was time to try "NO", the non-directional beacon (on 351kc) at Reno-Tahoe International Airport. Switching to tuning range to "2" and Antenna Tuning to "3", "NO" was found quickly. Since NDBs send MCW signals, the signals are easier to find if the detector is oscillating. In this mode, the Coupling is more critical and most controls interact significantly. Stability is also very difficult to achieve but the SE-1420 seemed to be fairly stable with a UX-201A tube. This isn't the tube type that was normally used with these receivers but this was just a test of operation. The next step was to try the Western Electric VT-1 and then the Moorhead ER, both typical tubes used with the SE-1420 back in 1920 or so. The WE VT-1 works very similar to the 201A tube except the filament voltage is 3.0vdc. The TICKLER settings and the condenser settings are very close to that of the 201A. Not so for the Moorhead ER. This tube runs about 4.0vdc on it's pure tungsten filament. TICKLER has to be advanced significantly and even though it is sensitive enough, it is difficult to tell when the tube is oscillating. Using a UV-201A tube, I was able to "tune in" 28 NDBs in a 30 minute period that evening. Greatest DX was YZH 343kc, Slave Lake, Alberta, Canada. Pretty good results for a single tube receiver. I next added a Pilot Radio Redi-Blox AF amplifier (ca. 1928) to boost the signal levels a bit. This is a transformer coupled, single stage audio amplifier using a UX-201A tube. With more audio, DDP 391kc in Puerto Rico was received (~3500 miles from here,) also YMW 366kc in Maniwaki, Quebec. Low power 25W marker beacons like SYF 386kc in St. Francis, KS and SBX 347kc in Shelby, Montana were also copied. In all, in two listening sessions, 50 NDBs were received including one newly heard 25W NDB, PA 396kc in Snohomish, Washington. Incredible performance from a 1920 regenerative receiver. To power up the IP-501-A requires 6vdc at about .75A "at the front panel terminals" for the A+ tube filaments (so the voltage can be adjusted for ~5vdc required for 201-A tubes,) 45vdc B+ for the detector plate and 90vdc B+ for the amplifier plates. A -4.5vdc C bias is also required. I generally use a Lambda 6vdc 4A power supply for the filaments but I have also used rechargeable batteries (however the power supply is more convenient to use.) For the B+ requirements I use a mid-twenties RCA Duo-Rectron B Eliminator which uses an 874 cold cathode regulator tube and a UX-213 full-wave MV rectifier tube. With the Duo-Rectron, regardless of the load, the B+ voltages remain constant. The -C bias can be supplied by a small battery since the load is negligible. I made my C battery out of three AA batteries for -4.5vdc. The antenna should be at least 75 feet long and worked with a good ground system. I have used a 75' sloper antenna that did a pretty good job. My best results came from my ham station antenna which is a 135' center fed tuned dipole with open feedline but with the feedline shorted and then connected to the ANT input. This, theoretically, results in a vertical antenna with a large capacity hat similar to the large "T" antennas of the twenties. It seems to work very well for MW and LF reception. I also use the ham station ground system. For the audio output, I used a set of Western Electric 516-W earphones. These are typical ferrous diaphragm type 'phones with a DC R of 2200 ohms. I tried to use a set of Baldies (Baldwin Type-E) but due to their design with direct driven diaphragms, they were "too loud" and seemed to respond to various types of noise better than the signals. When operating the IP-501-A as a non-oscillating regenerative detector, the COUPLING can be preset to the desired selectivity. Higher settings (tighter coupling) provide stronger signals but less selectivity. Lower settings (looser coupling) will increase the selectivity and can reduce signal strength. Generally, anywhere around mid-point will provide strong signals and fairly good selectivity. When the receiver is operated as an Autodyne (oscillating regenerative) detector, setting the COUPLING becomes more involved since many of the controls interact in this method of operation. You can set the COUPLING precisely by using the "Critical Coupling" method (described in the next section on Tuning in NDBs. )TICKLER is the regeneration control and this setting adjusts the sensitivity of the receiver. Usually the TICKLER is set to just before oscillation (regenerative) or just after oscillation (autodyne) for best sensitivity. As the wavelength increases, the TICKLER total inductance has to be increased (higher on scale.) Once the TICKLER is set it doesn't have to be adjusted too much for each particular tuning range. The INDUCTANCE switches select the tuning ranges. You will find that the Antenna Tuner settings won't necessarily match the Secondary Tuner settings. They are separate circuits so the Antenna Tuner settings will vary depending on the antenna and ground system used. The Secondary Tuner Meter Scale can generally be used for a rough starting point for tuning around. The dial's Meter Scale accuracy is dependant on several other factors when the receiver detector is operated as an Autodyne detector. Tuning In NDBs - Setting "Critical Coupling"
To receive NDBs, the receiver should be operated as an Autodyne detector. The stations can be roughly located and tuned using the Meter Scale on the SECONDARY CONDENSER dial and then using the ANTENNA CONDENSER to tune for maximum signal response. Adjust the TICKLER until you hear the detector go into oscillation. Use just the SECONDARY CONDENSER for station tuning and the ANTENNA CONDENSER to peak the signal. When "peaking" the ANTENNA CONDENSER, as you approach resonance you will hear a couple of loud clicks, a change in received frequency and the detector may stop oscillating. This is a result of too tight of coupling (COUPLING set too high.) Set the COUPLING lower on its scale and again tune through resonance with the ANTENNA CONDENSER. As the ANTENNA CONDENSER is tuned back and forth through resonance, listen to the clicks while reducing COUPLING. At "Critical Coupling" the clicks will stop and the detector will remain in oscillation. Tight coupling will over-drive the detector at resonance, causing the jump in and out of oscillation. The "Critical Coupling" setting is good for a fairly wide tuning range, usually at least 20 to 30kc. The TICKLER setting and the COUPLING setting do interact, so usually just the TICKLER is slightly adjusted when the detector drops out of oscillation. After "Critical Coupling" is set, adjustments to the TICKLER are very slight changes. Most tuning can be done using just the two main tuning controls, SECONDARY CONDENSER for tuning stations and peak with the ANTENNA CONDENSER, along with very slight adjustments of the TICKLER. As the ANTENNA CONDENSER is resonated, you will find that the received frequency changes slightly. This is normal interaction of the autodyne detector. Just slight readjustment of the SECONDARY CONDENSER is necessary for proper tuning. It would be next to impossible to find the weak NDB signals without the receiver set as an autodyne detector. This provides a heterodyne action so the carrier of the MCW NDB signal can be easily heard. Tune to "zero beat" and you hear the MCW signal of the NDB - or maybe two or three NDBs, as there are usually several NDBs assigned to each particular frequency. The same basic set ups are used for receiving AM signals but the detector must be operated as a straight regenerative detector (not oscillating.) The best sensitivity in a regenerative detector occurs just before the oscillation point. COUPLING is not a critical adjustment in this set-up and, though the COUPLING can be set somewhat tighter (higher on the scale) for AM, it's not really necessary. Anywhere from 45 to 100 is good for AM-BC. Set the TICKLER so that you can hear background noise coming in but not so it is oscillating. Tune around and find an AM station. Peak the signal with the ANTENNA CONDENSER and then adjust the TICKLER to just before the detector breaks into oscillation. The receiver is now operating with maximum sensitivity. Operated as a straight regenerative detector (non-oscillating) there is very little interaction between the controls. You have to keep the two main tuning controls in adjustment as you search around for different stations. The TICKLER doesn't need to be adjusted too much unless you find a really weak AM station you want to listen to. Since the IP-501-A and the SE-1420 use a regenerative detector with only an Antenna Tuner between the detector and the antenna, it is possible to couple a digital frequency counter to the antenna lead-in and then have an accurate frequency read-out. When the receiver's regenerative detector is oscillating it is partially acting as an oscillator and as a detector (autodyne detector.) The oscillator output couples into the antenna tuner and then into the antenna. Many times the old AM BC radios with regenerative detectors would be adjusted to oscillate for picking up weak stations and would then radiate the oscillating from the antenna. The radiated oscillations were considered interference and would be received by the neighbors over their radio receivers in the form of "bloops" and "whistles" that are mentioned in many old radio magazine articles. The regenerative detector's oscillations can be a fairly high amplitude and will easily drive a modern digital frequency counter. Since the detector is oscillating at the received frequency, the counter's display is the frequency that the receiver is tuned to. A simple three foot long wire connected to the counter's input with the other end of the wire wrapped around the antenna lead will couple enough signal into the counter for a read-out. Don't connect the counter ground to anything. This digital frequency read-out will only work when the receiver is oscillating. If the frequency read-out is erratic try increasing the TICKLER slightly for an accurate reading, then reset TICKLER for maximum sensitivity. Sometimes at the detector oscillation point the counter will respond to the detector frequency, the signal modulation and the received noise causing an erratic display. When you are searching for NDBs, it's a big help to know exactly where you are tuned. During my set-up for test-listening, I pre-set the receiver to around 770M. When power was applied, to my surprise, there was SX 376kc, a Canadian NDB up in Cranbrook, BC (it was only about 4:45PM local time.) That night, during a 30 minute period, I tuned in 25 NDB beacons from 326kc up to about 414kc. Best DX was DDP 391kc in San Juan, Puerto Rico. This is a 2KW transatlantic beacon but it is about 3500 miles from Virginia City, Nevada. Most difficult was probably ULS 395kc, a 25W marker beacon in Ulysses, Kansas. Subsequent sessions have tuned in YMW 366kc in Maniwaki, Quebec, also YY 340kc in Mont Joli, Quebec, both at about 2500 miles and IY 417kc in Charles City, Iowa, a 25W marker beacon. Additionally, Radio Rossii, the LW BC station on 279kc, located on Sakhalin Island was received, along with PN, the NDB at Port Menier, Anticosti Island, Quebec. In the three week period of 1/21 to 2/11, I tuned in over 100 NDBs with the IP-501-A - seven were never-before-heard NDBs. 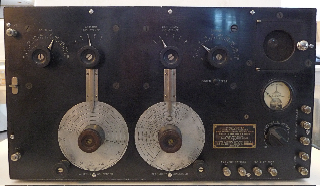 Impressive performance from an 87 year old, three-tube regenerative receiver. The following is the log of the NDBs copied using just the IP-501-A receiver and the 135' tuned dipole antenna with the feedline shorted. NDB location, frequency and power (if know) are listed. This log will be updated as more NDBs are copied on the IP-501-A Total as of Feb. 11, '09 is 103. IP-501 featured in "Robot Monster"
For those of us who are constantly watching in the background of old B&W movies to see if we can spot a recognizable vintage radio, the IP-501 family is probably the most elusive of radios to be spotted. There are only a few movies that used any of the IP-501 family as a prop. Fortunately for IP-501 fans, the receiver did make into what is probably one of the best known examples of "budget-challenged," movie-making disasters - "Robot Monster" - a 1953 sci-fi movie created by Phil Tucker. The movie was supposedly filmed in four days for a reported $16,000. Sometimes listed as the worst movie ever made (Guinness Book of World Records,) "Robot Monster" is actually entertainingly funny because it's so, so bad. Its incompetent production has earned it "Cult-Movie" status. The movie's infamous use of the IP-501 as a movie prop has the receiver as part of the "Automatic Billion Bubble Machine." The still photo from the movie (right) shows the Automatic Billion Bubble Machine next to the movie's rotund space alien-villain Ro-Man XJ2 (in the gorilla suit with diving helmet.) The equipment blows a copious amount of bubbles while in operation and allowed Ro-Man to communicate with his unreasonable leader, "The Great Guidance," located somewhere in space (conflicting advertising stated the Moon, then Mars - the movie is vague but shows a lot of craters whenever "The Great Guidance" is contacted.) "The Great Guidance" (who looks just like Ro-Man but without the telephone microphone glued to the window of his helmet) has a affinity for Jacob's Ladders and has several in operation during his communications with Ro-Man. The credit for the Automatic Billion Bubble Machine was listed as a company called "N. A. Fischer Chemical Products" but this was probably for the bubble solution rather than for the radio props. Besides the IP-501, there is a Hallicrafters S-20R, Hallicrafters HT-18 (upside down on the IP-501,) a Hallicrafters panadaptor and a set of low-budget TV rabbit ears. Though other villainous space aliens would probably have had a nice console to house their sophisticated communications gear, Ro-Man had to settle for a cheap wooden table outside his cave hideout on Earth. Even his view-screen, which looks a lot like a roll-down window shade, is located on the other side of the cave. Fortunately for radio spotters, the IP-501 and the rest of the radio gear is featured in many close-ups several times throughout the movie. It seems Ro-Man needs constant reminding of his mission objective from "The Great One" - as Ro-Man sometimes addresses "The Great Guidance" - so he uses the Automatic Billion Bubble Machine a lot in the movie. There is a plethora of information on "Robot Monster" on the web, or if you appreciate inept movie-making, the DVD is available almost anywhere. It was reported in the Guinness Book of World Records that Phil Tucker attempted suicide due to unanimous panning by the critics of "Robot Monster." All of the negativity didn't stop Phil Tucker as he later returned with another masterpiece - "Cape Canaveral Monsters." photo above: Ro-man XJ2, not your average gorilla wearing a diving helmet. NAVY-RADIO.COM - For the most detailed information Pre-WWII, including many photos of SE-1420 installations and other early Navy gear and on all types and all vintages of Navy radio equipment, radio stations, vintage photographs - go to www.navy-radio.com Nick England's incredible Navy-Radio website has the most information available.